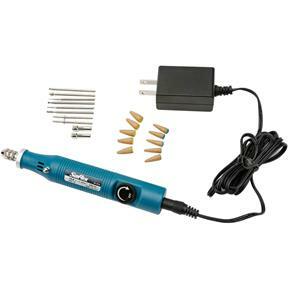 This pencil style Rotary Tool comfortably fits in your hand for precise use. The variable speed control dial selects speeds from 4000 to 14,000 RPM, letting you select just the right speed for the right job. Tool changes are easy with a built-in spindle lock and knurled collet nut. Includes 3/32" & 1/8" collets, 2 steel burrs, 4 diamond burrs, 2 mandrels, and 10 abrasive cones - a great kit for beginners and experts alike!